Turkey's Kurds may emerge as the biggest obstacle to Islamist rule in the not-too-distant future. 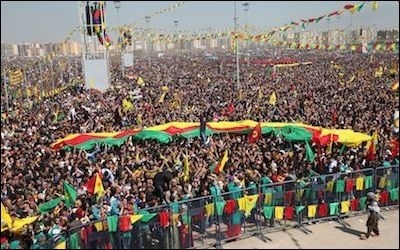 In 2015, soon after the Turkish people went to the ballot box, the main Kurdish insurgency group, the Kurdistan Workers' Party (PKK), ended a ceasefire it had declared two years prior. Just a few months earlier, there had been hope for peace. Even Turkish President Recep Tayyip Erdoğan's fiercest critics praised him when he bravely launched a difficult process meant to finally bring peace to a country that had lost 40,000 people to ethnic strife. His government negotiated with the Kurds and granted them broader cultural and political rights, which his predecessors had not. The PKK would finally say farewell to arms. Instead, it took up arms once again. Since July 2015, Turkish (and Turkey's predominantly Kurdish) cities have again become battlegrounds in an almost century-old Turkish-Kurdish dispute. Kurdish militants have attacked security forces countless times since then, while the Turkish military has buried fallen soldiers and raided Kurdish guerrilla camps in northern Iraq as well as inside Turkey. Reports of casualties on both sides are a regularity most Turks now grudgingly ignore. Erdoğan, an Islamist, had miscalculated again. He had thought he could solve the dispute through his usual "religious lens." He would use Islam as the glue to keep Muslim Turks and Muslim Kurds united, because after all, why should they fight? They are all Sunni Muslims. Erdoğan believed that a greater role for Islam in Turkey would help resolve its ethnic conflicts. Erdoğan believed Islam had to take a central role if a historic end to the conflict was to be achieved – one in which the Kurds would surrender their arms and live peacefully with their Turkish Muslim brothers. He wished, accordingly, to restructure Turkey along multi-ethnic lines, but with a greater role for Islam. But he relied too much on religion to resolve what is essentially an ethnic conflict. The experiment resulted in sprays of bombs, suicide attacks, bullets, rockets, and coffins. The parliamentary elections that took place on June 7, 2015 marked a radical shift for Erdoğan from his usual religious nationalism to ethnic nationalism (both of which have always been part of his ideological policy calculus, to varying degrees). On that date, his Justice and Development Party (AKP), after having sought peace with the Kurds for the previous two years, lost its parliamentary majority for the first time since it came to power in November 2002. With 41% of the national vote (compared with 49.8% in the 2011 general elections), the AKP won eighteen fewer seats than were necessary to form a single-party government in Turkey's 550-member parliament. More importantly, its seat tally fell widely short of the minimum number needed to rewrite the constitution in such a way as to introduce an executive presidential system that would give Erdoğan almost uncontrolled powers. The June 2015 parliamentary elections marked a radical shift for Erdoğan from religious nationalism to ethnic nationalism. Amid a fresh wave of Kurdish violence, Erdoğan gambled on new elections, calculating that the uptick in instability and insecurity would push frightened voters towards single-party rule. His gamble paid off. The elections of November 1, 2015 gave the AKP a comfortable victory and a mandate to rule until 2019. His new ethnic nationalist and anti-Kurdish policy won hearts and minds among Turkish nationalists. They then proceeded, two years later, to support constitutional amendments that paved the way for Erdoğan's ultimate goal of one-man rule. Between June 7 and November 1, 2015, Erdoğan's AKP increased its votes by nearly nine percentage points. More than four points of that rise came from votes from its nationalistic rival, the Nationalist Movement Party, which shares more or less the same voter base with the AKP. Even some Kurds, weary of renewed violence, shifted from a pro-Kurdish party (for which they had voted on June 7) to the AKP (on November 1). Since 2015, Erdoğan has been enjoying the fruits of his newfound ethnic nationalism. He has ordered the security forces to fight the PKK "till they finish it off," and has pursued hawkish politics via the judiciary he controls. Several leading Kurdish MPs are now in jail on terrorism charges. More than 1,400 academics who signed a petition "for peace" have been prosecuted and/or dismissed from their universities. Talking about Kurdish rights is now almost tantamount to bombing a square in Istanbul. Talking about Kurdish rights is now almost tantamount to bombing a square in Istanbul. Across Turkey's Syrian and Iraqi borders, Erdoğan has also recalibrated his policy in line with a reprioritizing of security threats. A Kurdish belt along Turkey's southern borders is now perceived as the top threat – worse than ISIS, or Syrian President Bashar al-Assad's pro-Shiite (and therefore anti-Sunni, anti-Turkish, and anti- Erdoğan) regime in Damascus, or the growing Shiite military presence in northern Iraq (Hashd al-Shaab). In the hope of countering what he considers the worst of all possible threats, Erdoğan is now a reluctant partner in the Russia-Iran-dominated Shiite theater in northern Iraq and Syria. In Erdoğan's view, the emergence of a near-state Kurdish actor in Mesopotamia would be an existential threat to Turkey. Hence his radical retaliation against the Iraqi Kurdish referendum of September 25, along with his reluctant alliance with Tehran and Tehran-controlled Baghdad. But there is more for Erdoğan to calculate. When he devises his policy calculus towards the Iraqi and Syrian Kurds, he must also keep an eye on the Turkish Kurds, whose votes he will need in 2019 when Turks go once again to the ballot box. Election 2019 will be the most historic race in Erdoğan's political career – an election he knows he cannot afford to lose. He needs every single vote, from Islamists to liberals to nationalists to Kurds. And that makes things tricky. Erdoğan has discovered that he wins more votes playing to nationalist constituencies rather than the Kurds. Election 2019 will take place at a time when both Erdoğan and the insurgent Kurds will have less appetite for a new peace-based political adventure. Kurds trust him less than they did between 2011 and 2013. At the same time, Erdoğan has discovered that he wins more votes if he plays to nationalist Turkish constituencies rather than to Kurdish ones. He will be more reluctant to shake hands with Kurds than he was in 2013. Although the Turks have a clear military advantage, the Kurdish minority possesses a weapon of its own: the fertility rate in Kurdish-speaking parts of Turkey is higher than in the Turkish-majority regions. The Kurds may emerge as the Turkish Islamists' main rivals in the not-too-distant future simply by virtue of their having more babies. There are, moreover, sociopolitical and demographic reasons to anticipate that both Islamists and Kurds will perform better in the upcoming Turkish election. From a political perspective, Turkey is becoming increasingly right-wing and religiously conservative. F. Michael Wuthrich of the University of Kansas Center for Global and International Studies has demonstrated that Turkish voting bloc patterns have progressively shifted to the right, from 59.8% in 1950 to 66.7% in 2011. This pattern, presumably still in progress, will work in favor of the AKP and any other political party championing Islamist-nationalist ideas. The Kurds may emerge as Erdoğan's main rivals in the not-too-distant future simply by having more babies. But the Kurds' demographic advantage is significant. At present, the total fertility rate in eastern and southeastern, Kurdish-speaking Turkey is 3.41, compared to an average of 2.09 in the non-eastern, Turkish-speaking areas. Erdoğan has urged every Turkish family to have "at least three, if possible more" children, but things are not moving as he wishes. The total fertility rate in Turkey has in fact dropped from 4.33 in 1978 to 2.26 in 2013. Just as less-educated (and more devout) Turks grew in number and percentages over the past decades and brought Erdoğan to power simply by combining demographics and the ballot box, the Kurds may emerge as the Turkish Islamists' main rivals by using the same political weapon. As he campaigns ahead of the 2019 election, Erdoğan will have to find a miracle equilibrium: how to win Kurdish votes without losing nationalist Turkish votes? So far, he has managed this challenge exceptionally well. He has won nationalist votes, and his party has come in second in Kurdish regions of Turkey. In 2019, however, he will face a bigger challenge.